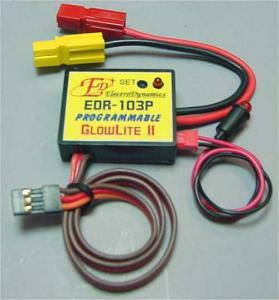 There's no fear of flameouts, GlowLite's onboard! Confidence is... a GlowLite Onboard! No-Hassle Onboard glow driver for Single-cylinders, Twin-cylinders and Twin engines. Light! Less than 1 oz. Just plug into your throttle (with a Y-harness) or aux channel, connect your onboard glow battery and glowplug and have the peace of mind of reliable idle, and the safety of not needing fingers near that spinning prop! Now PROGRAMMABLE for Even Easier Setup!